ASI Panels feature a range of sustainable collections including handcrafted products, sculptured and embossed MDF, woven woods, end-grain wood veneers and reclaimed barn wood adding texture, richness and dimension to any interior. ASI Decorative Surfaces and Laminates are unbelievably textured materials reflecting the luxe look of embossed leathers and skins, vinyl films in high gloss colorations and simulated wood grains, high pressure laminates plus a fresh take on ceramic tiles that are all designer-infused for a dramatic effect. 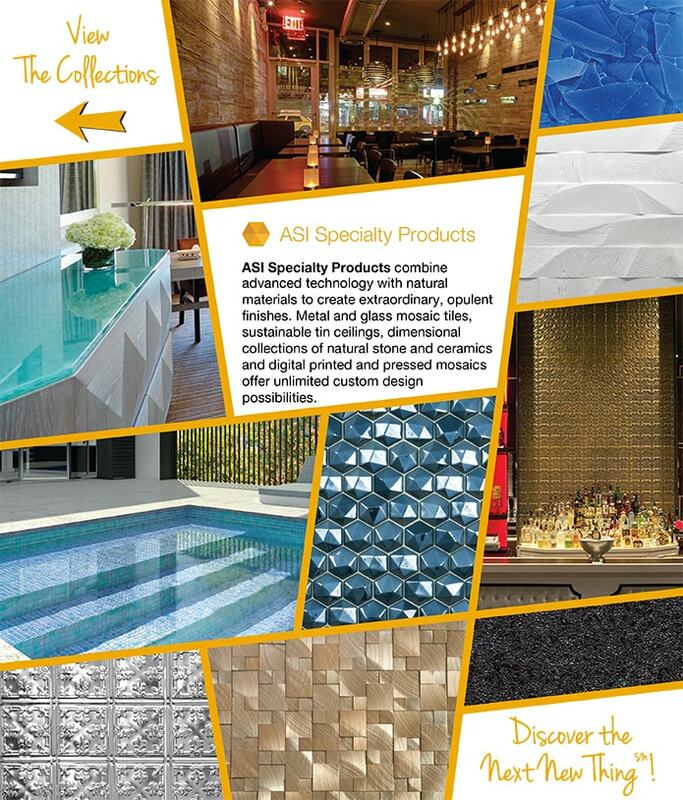 ASI Speciality Products combine advanced technology with natural materials to create extraordinary, opulent finishes. Metal and glass mosaic tiles, sustainable tin ceilings, dimensional collections of natural stone and ceramics and digital printed and pressed mosaics offer unlimited custom design possibilities. Specified Solutions is a proud distributor of Architectural Systems, Inc. (ASI), a leading global distributor of distinctive and affordable interior finishes. Since its founding, ASI has been known for its innovative products and fresh thinking for commercial interiors. Clients return again and again for ASI’s expertise, commitment to service, project solutions and collective eye for WHAT’S NEXT® in materials.